It is good to check how much space you will need for your /home partition. 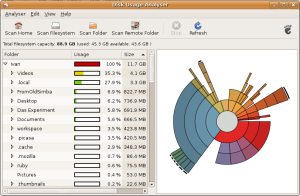 Use “Scan Home” in Disk Usage Analyzer (Applications->Accessories->Disk Usage Analyzer) to check how much space do you use now. This tool will give you excellent perspective on how you use your disk space – and where you can possibly save a few gigabytes. Add some gigabytes on top of the current usage figure for future use and now you now what should be the size of your new /home. In Ubuntu there's an excellent tool for manipulating partitions - GParted (System->Administration->Partition Editor). If the estimated size of your home partition is smaller than the size of Vista partition (or any other partition you’re prepared to re-allocate), then the task is really simple – you just convert Vista’s ntfs partition into ext3. In my case all my data in /home folder didn’t fit into 40Gb, so I had to resize the root / partition. This is not possible while the system is running, so I had to burn Ubuntu Live CD, boot from the CD with “try Ubuntu without affecting you current system” option, and run GParted from there. Note, that resizing and moving partitions is a time-consuming process – it may take hours, depending on the size of your partitions, so reserve enough time for this operation. That is a copy with “preserve links, preserve mode, ownership, timestamps, copy directories recursively, stay on this file system” parameters. Voila! Now your /home is on its very own partition. Thank you for this simple yet comprehensive (and most importantly – ACCURATE) guide. Very nice. Easy to use. I did, however, have the problem of not being able to log in. Said something about trying to log in as root, then said I had no permissions. Once I did this, everything was great! Thanks, my /home moved without any problems. After a near nervous breakdown I have access to my new home folder again! Thank you for the guide. Unfortunately I can not copy my old Home folder to the new Partition. It’s weird, I created a 15gb Partition (ext4) for home, then I mounted it and started to copy the files. If I look for properties of the old home folder it says 20000 Items, totalling 4.9gb. But the copying process takes very long. There is much more data than 4.9gb copied. Even the 15gb Partition is too small. Everything else seems to work. Why is more then 4.9 Data being copied? I even used in on an Ubuntu installed image on a VM Virtual Box and it works great. Way to go.